The title of this post is misleading. I don't normally reply to the BS here but I will on this one. Sarah is referring to grocery stores that sell beer and wine. Allot of them exist in the south. She is clearly making reference to the fact all customers are required to show their ID for alcohol purchases. How do you "shoot" down a drone with "little" damage? I don't see it happening without destroying the drone. "D"
lol...ok. So do I and I just used the commands I posted to make sure. All is good then. It will get the result needed. "D"
Backwards! lol Should be... ALT-PRINT SCREEN(SYSRQ) Entire Screen CLT-ALT-PRINT SCREEN(SYSRQ) Active Window "D"
"The U.S. Government to Remove Iraq From Chapter VII"
I believe I read where massive amounts of "Yellow Cake" uranium was found and quickly moved out of Iraq under the radar scope and sold to Canada... http://www.talkshowamerica.com/2008/07/yellowcake-uranium-wmds-from-iraq-moved.html "D"
Wouldn't that be adjusted as well as food prices etc.? For example.....A coke costs 1,000IQD now. The zero's shift (RD or RV) the can of coke is now 1IQD. I would assume if an Iraqi worker makes 300,000IQD per month, that salary too would be adjusted in the process to 300IQD per month. "D"
It means they will Re-denominate (25k becomes 25) then raise the value. Not thinking I will be rich but I might make 3 or 4 times my investment. "D"
THEE ZEROS RAISING FOR LOCAL ECONOMY ONLY!!! I actually own quite a bit of Dinar and been in this investment since 2003. "D"
Why the insult? I invested in 2003 and paid $640.00 per mil. 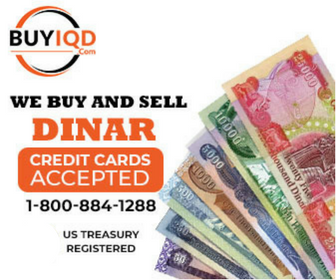 I bought my Dinar in Iraq. At that time I believed I could be rich. After years of acquiring information I have come to the conclusion there will be no reval. That is my opinion. I have already made some money on my investment. "D"
IMHO...You will be heart-broken soon along with many others. "D"
It's not that we "Lopsters" do not want it to RV. There is NO real proof for a reval and plenty of history showing a higher probability you will see a LOP. I would love to see a RV and be rich...but it's not going to happen. "D"
Any updates to this? "D"
Can we have a higher quality pic to enlarge? People need to understand what they are reading. What this article is saying is that Airmen and Soldiers receive IQD when they go to finance and request cash from their Eagle Cards for local purchases while in Iraq. Their paychecks are still going into their bank accounts in USD. I am prior Air Force and a Contractor in Iraq & Kuwait and currently in Afghanistan...yes I have a Eagle Cash card. This was posted earlier. "D"